Who put the jerk in jerky? I marinated it for one day and put it on a rack in the warming oven of the cookstove until it was dry. We joked around about hanging it on the sock (corn) drying rack above the stove, but decided that since Trace likes to get dirty socks out of the laundry, jerky scented socks may be too much of a temptation! Plus, who wants unsightly jerky buildup on their socks? Although that may be good for meter readers and mailmen… . About half way through the process we started nibbling on a piece here and there – and it was delicious while it was still a little pliable, and even better when fully dried. What I liked about the recipe was that it was for a pound of meat, making it easy to try with a package of bottom round steak or something of that nature. I thawed my steaks and partially refroze them, and after slicing I weighed the meat and adjusted the recipe. I did get little lazy and didn’t mince my garlic very fine, but the dried marinated garlic chunks are good too. Just gives me an excuse to make some more. Not really a zero mile snack due to the spices etc., but definitely a keeper. This post is part of Food Renegade’s Fight Back Friday series. Lots of gluten free and nutrient dense food discussions going on over there – check it out! OOOO, I have some venison in the freezer that’s calling to be used with this recipe!!! wooo thank you for sharing it with us, I LOVE jerky! 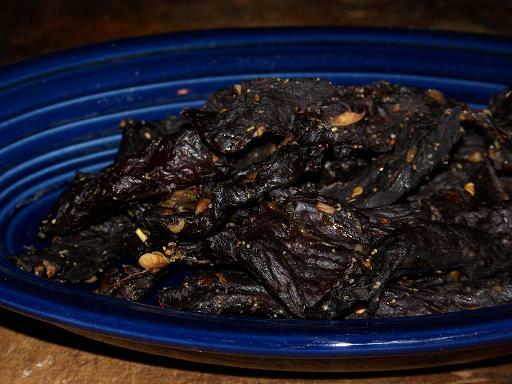 We make our own jerky too, and the recipe sounds very similar to the one I use. We make a bit of jerky every year. I’ll have to try this one because the one that I make is FULL of msg, and liquid smoke…….not exactly what I like to be eatin’! Thanks for the recipe link! Sarah, this is a pretty good one, and open to a little fudging here and there. With good ingredients, who needs the MSG and other stuff anyway. The test for me was if my joints and/or feet ached the next day after eating some. Not a whisper of creakiness…well, maybe a little. 🙂 Sometimes when my friends complain about getting old, and feeling old, I think about their SAD diets are more of a contributor than they would like to think.